The New Ulm Country Club is a picturesque 18-hole, par 71, semi-private course surrounded by Flandrau State Park and perched atop the bluffs of the Cottonwood River. A distinctive feature of the course is the many mature oak trees that border the fairways. The Country Club was established in 1929 as a nine-hole course and expanded to 18 holes in 1966. The front nine saw a remodeling effort in 2001 with the addition of hazards, tree boxes and sand-traps to add an overall depth to the course. Several tournaments happen throughout the year; call for more information on those. The clubhouse is complete with bar service, a recently remodeled dining room and banquet area, airy meeting rooms, clean locker rooms and a complete pro shop. The restaurant operation is open year round, and they welcome banquet-style gatherings. 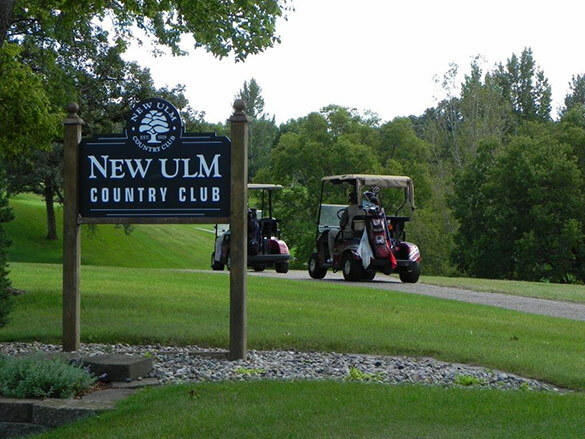 Green fees are available for guests of members and for visitors to New Ulm.